The Long Nosed Distichodus (Distichodus Lusosso) also known to tropical fish keeping enthusiasts as the Long Snout Distichodus, is a seldom seen species that originates from Cameroon, the Republic of Congo, the Democratic Republic of Congo. 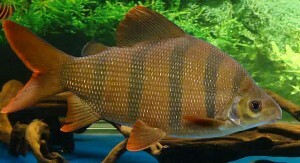 Juveniles are frequently misidentified and sold as the more common Six Banded Distichodus (Distichodus sexfasciatus) which is found in Lake Tanganyika located in Cameroon, Democratic Republic of Congo, Tanzania. Long Nosed Distichodus are collected in large rivers and grow to a length of 15″ in the wild. Like its close relative, Distichodus sexfasciatus, the Long Nosed Distichodus has a “perch” like coloration with black vertical bars on its flanks over a yellowish body, with bright red fins. It is smaller than Distichodus sexfasciatus and more easily recognized by it’s much longer snout. Although the Long Nosed Distichodus is generally a peaceful species, they can be unpredictable in a community tank setting with similarly sized fish. They can be kept in small groups of 5 or 6 of their own kind or when housed in a very large tank, with other large Caracins, Cyprinides like Tinfoil Barbs, Loricariids, catfish, or Bichirs. They should never be housed with smaller or shy tankmates. Housing a single show specimen requires at least a 55 gallon or larger tank with a sand or gravel substrate, smooth river rocks, some driftwood and hardy plants such as Bolbitis or Anubias spp. . These fish are omnivorous and will decimate almost all of the softer vegetation growing in the tank. The tank should be equipped with a good filter that provides some water flow and since they are great jumpers, a tightly fitting cover. Bi-weekly 30 to 50% water changes are needed to keep these fish in good condition. Long Nosed Distichodus (Distichodus Lusosso) have never been bred in an aquarium environment. Although their spawning methods are unknown, they are believed to behave like other large characins by migrating at the beginning of the rainy season and spawning upriver in the submerged forest areas. Longsnout Distichodus are largely omnivores with the majority of their diet being plant matter. In the wild they feed on a variety of soft vegetation, worms, and bottom dwelling invertebrates. In an aquarium environment, they will eagerly accept most prepared foods, including Spirulina flakes and small omnivore pellet foods augmented with large amounts of vegetable matter. They should also be provided occasional supplements of live and frozen foods such as earthworms , tubifex, bloodworms, prawn, mussels, frozen shelled peas, blanched spinach, a piece of leaf lettuce, etc. Because the Long Nosed Distichodus is seldom if ever available to tropical fish keeping enthusiasts and because they are so expensive when they are available, they are recommended for advanced fish keepers only. As juveniles they are quite attractive but they lose much of their color as they become adults. They are seldom available online and almost never in specialty tropical fish keeping shops at any size. When available, they command a respectable price.